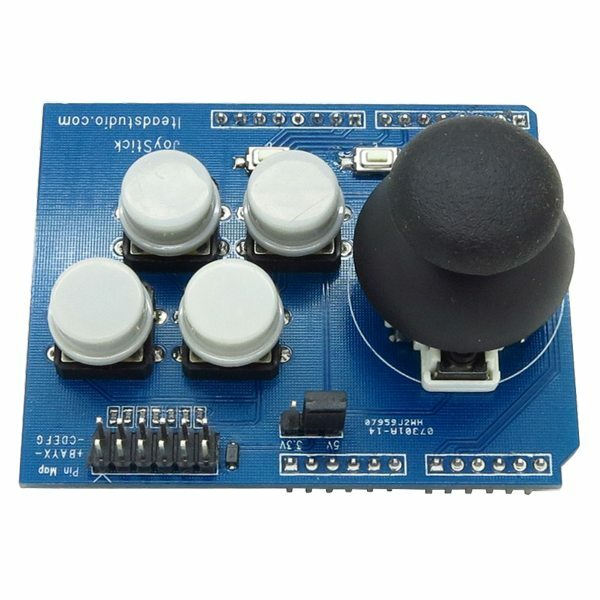 The Joystick Shield mounts onto an Arduino or compatible microcontroller to provide a joystick with push buttons. 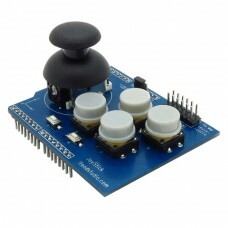 The two-axis analog joystick features a classic video game action. There are four large round buttons and two small ones. The joystick itself can be pressed for a total of seven buttons. This shield could be used to build a controller for your robot, game or other project. It would be a great UI User Interface for an Arduino based wireless remote control project. The momentary push buttons are attached to Arduino digital inputs D3- D9 and read as a logic low when pressed and high when not pressed. The vertical joystick axis is read as a voltage on analog input A1 and the horizontal axis as a voltage on analog input A0.